A classic pub challenge, the Mug Puzzle Trick will certainly leave the audience puzzled. The magician sets out three mugs on a bar top, some face up and some face down and claims that he can have all three face up in three moves. Quickly he reaches out with both hands and flips over two mugs and then again and again and all three are face up. Resetting the mugs the magician invites a spectator to try to duplicate the feat, but it cannot be done. Once the mugs are reset, in a different starting pattern, getting all mugs face up is impossible in three moves. Three mugs, three glasses or three paper cups, the Mug Puzzle Trick will work the same with any similar props. This is one of those pub tricks that helps to establish a magician’s air of mystery. While anyone paying close enough attention will be able to figure out the puzzle, it will serve its purpose the first time the magician shows it off. Another advantage of The Mug Puzzle Trick is that it requires only a table and three mugs or glasses and can be done anywhere, with no worries about angles or point of view. As long as the audience can see the mugs, the magician is set to go. 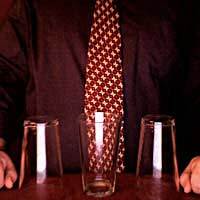 The magician sets out three empty mugs on a table or bar top before him and declares that he can turn them all face up in three moves, but there are special rules to how the moves can be made. Reaching out, the magician turns his hands inward, thumb side down and grasps mug B and mug C and then flips them over. This is Move Number One. The magician reaches out again and grasps mug A and mug C in the same manner, flipping them over. This is Move Number Two. Finally, the magician reaches out and grasps mug B and mug C once more, flipping them over to complete Move Number Three. Now all mugs are face up. “Let me rest this” the magician says, and flips mug B bottom up - this is not the same starting position he used, but the audience will not realise this. Now the magician invites a spectator to give it a try. No matter how they try - even repeating exactly the same moves the magician used - they will not be able to get all three mugs top up. This trick works great as a wager among pals, but it works even better in a routine specially designed for it. Take tricks from here and elsewhere that all have the theme of the magician being able to “beat” his audience in various feats and combine them together for a fun, interactive magic routine.